This most definitely is a review. British playwright Harold Pinter’s The Room gets The Wooster Group treatment in their production, now playing at REDCAT in Downtown L.A. 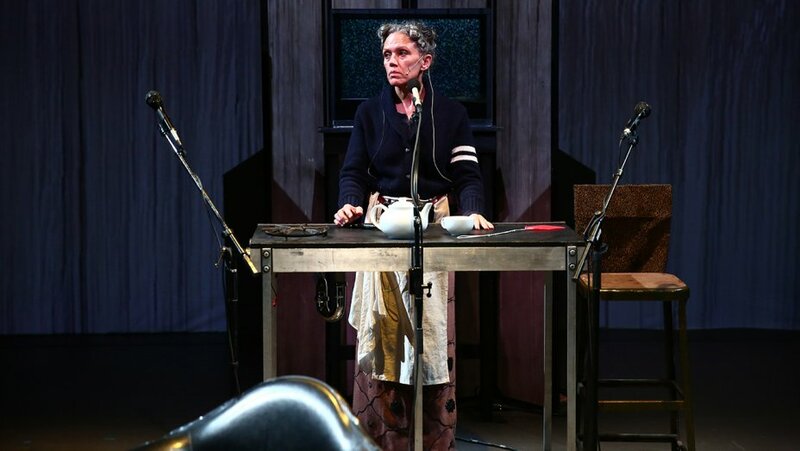 In The Room, Rose (Kate Valk) is a timid, agoraphobic and garrulous woman. She incessantly talks about her fears of leaving the room she shares with her mostly silent husband Bert (Scott Renderer), fears of the now-subdivided mansion’s basement, of the cold weather outside and mysterious unknowns beyond her four walls. An encounter with her landlord Mr. Kidd (Ari Fliakos), and later with a strange couple she hears on the stairs, amplify her mounting paranoia until tragedy occurs. Produced in 1957, Harold Pinter’s The Room is the first play by one of the most important playwrights of a generation. 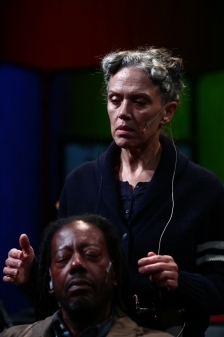 For this production, as directed by Elizabeth LeCompte, The Wooster Group company employs a number of devices to achieve a sense of alienation — both for the performers and their text and for the audience and the play. A key technique is the use of an actor, (Ari Fliakos, who takes on three roles including narrator), who reads all of Pinter’s stage directions aloud. Often the actor performs an action that purposefully doesn’t match the articulated stage direction. Another device is the presence of sound technicians on the periphery of the stage, yet in full view of the audience. These, plus other elements, such as the troupe’s use of xiansheng — more on that in a minute — all collaborate to create a distancing effect; you are constantly aware you are watching a stage play. Not for one moment can you adopt the usual stance of pretending that what is unfolding on stage is ‘real’ or ‘really happening.’ Interestingly enough, our emotional connection is not dampened by these theatrical techniques. The Wooster Group amp up the threat present in Pinter’s existential text, particularly with their apt use of spooky original music, composed by Omar Zubair complemented by the menacing sound design of Max Bernstein and Eric Sluyter. The Wooster Group are known for making abundant use of Brecht’s Verfremdungseffekt (translated as “defamiliarization effect,” or “estrangement effect”). Theatrical devices such as actors directly addressing the audience (sometimes by stepping out of character), as well as bright stage lighting; here the house lights are left up at full level for the start of the show, slowly dimming throughout the 45 minute duration. Another common Brechtian device is the use of songs to interrupt the action abruptly, so several times one or other of the actors suddenly breaks into a country folk tune infused with a Chinese flavor, pretending to strum a fly-swat as another performer (on the edge of the stage) plays the mandolin. According to ArtNet News, “The entire time they are performing, the group’s actors have the sounds of traditional Chinese “crosstalk comedy” piped into their ears [through earbuds]. The effect seems to be that they can’t quite settle into their characters, but have to be always aware of their act of speaking. What all this boils down to is a palpable tension that’s evident in both the text and in the non-naturalistic acting style. The actors recite their lines awkwardly, yet with some emotion and expected expression. Leading up to last Thursday’s opening night, a controversy erupted when REDCAT sent out a press release explaining how Samuel French Inc. had “forbidden” reviews of this L.A. production. Go here to read my ‘op ed’ about all that off-stage drama. The Wooster Group’s version of The Room is essentially a curiosity piece. So, it really depends on how curious you are about this show. If you enjoy experimental theater, I suggest you see this production before it disappears forever. As publishers of Pinter’s works, Samuel French Inc. has denied all permissions to The Wooster Group for any future staging.